To get started go to the Membership page and click on Open an Account button. This will start the online application process. The application process should take around 10 minutes. Your no-fee checking includes a Membership savings account and many other benefits. You can become a Member of RCU if you live, work or own a business in the counties of Sonoma, Marin, Napa, Mendocino, Lake, San Francisco, Solano, or Contra Costa. You are also eligible to join if you are an immediate family member of a current RCU Member, or if you work for a designated Select Employer Group. Please contact your company's human resources department to learn if RCU is your designated credit union. 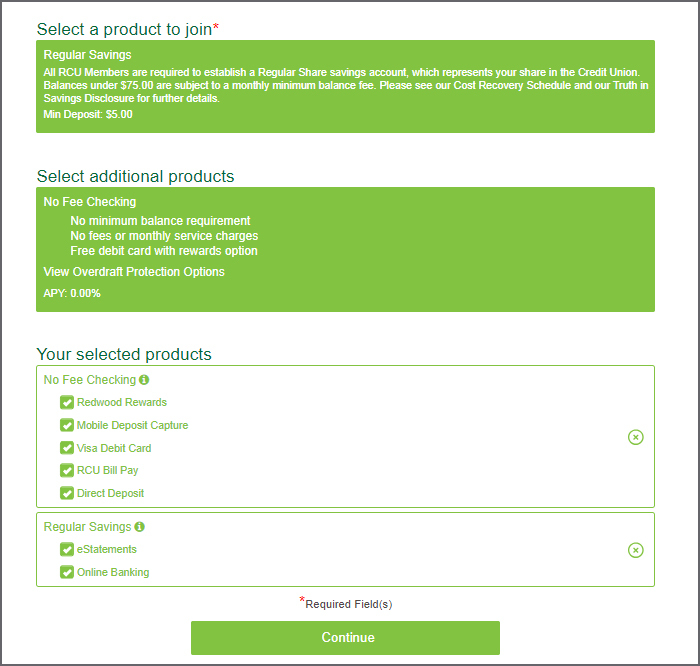 Select one of the options for eligibility and select products. All RCU Members are required to establish a Regular Share savings account, which represents your share in the Credit Union. Balances under $75.00 are subject to a monthly minimum balance fee. Please see our Cost Recovery Schedule and our Truth in Savings Disclosure for further details. Min Deposit: $5.00. 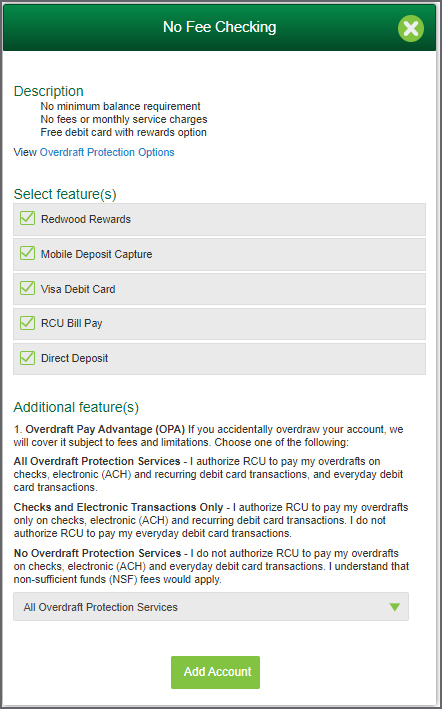 When you select your Regular Savings product the features include Online Banking and eStatements. You can uncheck any of the options. Click Add Account button to continue. You can uncheck any of the options. Click Add Account button to continue. 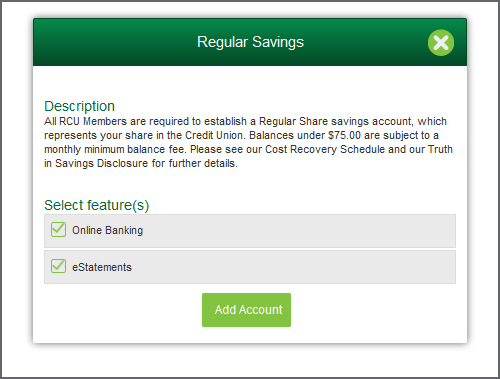 Once you have completed the Eligibly Options click Continue button to add your Personal Information. Once your information is filled out you have to option to continue and add a Co-Applicant or continue without filling out the Co-Applicant information. The final step is to fill in your funding information. Deposit funds into your new account. Once you have completed your Membership application you will be provided your new account number. 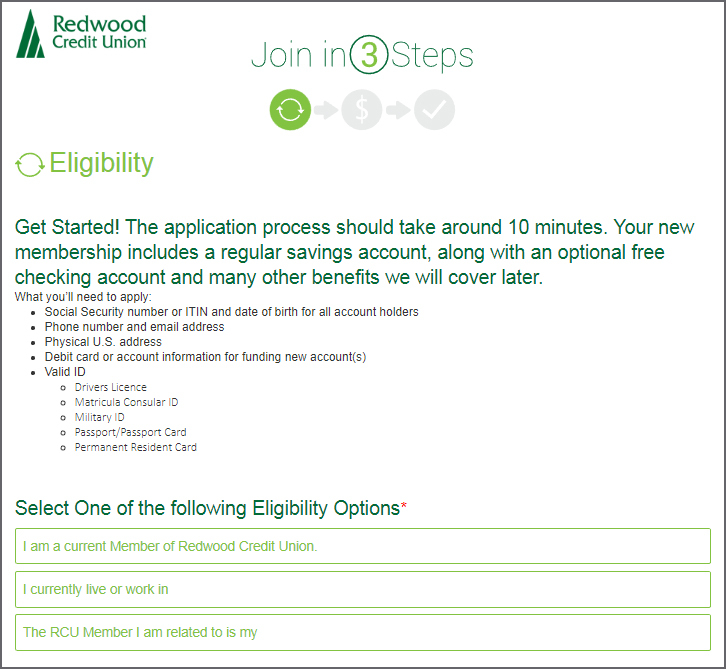 You can now use your account information to enroll in online banking. If you have any questions please call our Member Service Center at 1-800-479-7928 or 707-545-4000. Monday through Friday 7 a.m. to 8 p.m.
Saturday from 8 a.m. to 4 p.m. Membership open to anyone living or working in the greater North Bay and San Francisco. Some restrictions may apply. *Non-deposit investment products and services are offered through CUSO Financial Services, L.P. (”CFS”), a registered broker-dealer (Member FINRA/SIPC) and SEC Registered Investment Advisor. Products offered through CFS are not NCUA/NCUSIF or otherwise federally insured, are not guarantees or obligations of the credit union, and may involve investment risk including possible loss of principal. Investment Representatives are registered through CFS. The credit union has contracted with CFS to make non-deposit investment products and services available to credit union members. Casino/gambling ATMs excluded. Reimbursements deposited to your RCU account the next business day. Accrue 1 point for every $1 you spend using your RCU Visa credit card and 1 point for every $2 you spend using your RCU Visa debit card (signature-based transactions only). Business accounts are not eligible. How do I apply for Direct Deposit?